Mozart’s Divertimento K522 (also nicknamed ‘A Musical Joke’) is said to be inspired from his pet bird, a starling. The awkwardness of the piece is said to mimic the way starlings whistle off-key. Likewise, Beethoven’s Sixth Symphony incorporates the song of a yellowhammer followed by a quail and a cuckoo’s. The woodwind bird-calls in Mahler’s Seventh Symphony and Handel’s ‘The Cuckoo and the Nightingale’ also confirm how many classical composers have found inspiration from nature. As composers and musicians turn to the natural world for stimulation, an interesting question is whether music had always existed naturally in the universe and merely discovered by humans (like how the discovery of fire led to cooking all kinds of cuisines), or whether music is a wholly artificial creation altogether. While the question may never be satisfactorily answered, a look into the natural world outside the human context may give us some idea. One example is the research indicating that fish can learn to distinguish classical music from blues1, possibly suggesting that music perception existed some 500 million years to the earliest jawed vertebrates. Yet, research on non-human primates and new born babies have indicated that they are incapable of recognizing melodies as relational structures, suggesting that music perception may have only evolved in the last few million years. Can animals truly understand music? Most studies on nonhuman species like monkeys indicate that animals encode absolute pitch and are generally unable to recognize relative pitch. Songbirds on the other hand have shown to demonstrate a relative pitch strategy, with an ability to recognize patterns that rise or fall in frequency regardless of absolute frequency. However, this ability is lost when the sequences are shifted out of the trained frequency range. Why then do birds ‘sing’? Or more precisely, do birds sing? Physically, birds ‘sing’ because they possess neural song circuits and a complex vocal organ that are activated when hormone levels surge. All birds also share a syrinx, which is a complex structure in the bird’s chest at the base of the trachea between the lungs that is devoted to sound-making. 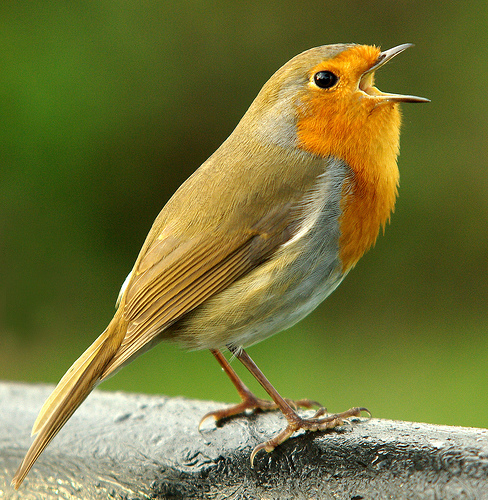 Although birds do possess a larynx, no bird is known to use it to make sounds. Also, natural selection has allowed the ancestors of singing birds to out-reproduce those that did not. This could be due to better attraction leading to better mates, and better defended territories. It used to be thought that birdsong was the only form of animal music found in nature, but the relatively recent discovery of marine animal vocalisation in whales, dolphins and seals have led to new insights. There are also now two studies that suggest that some nonhuman mammals, namely the rhesus monkey and dolphins, are capable of relative pitch measured by octave generalizations. 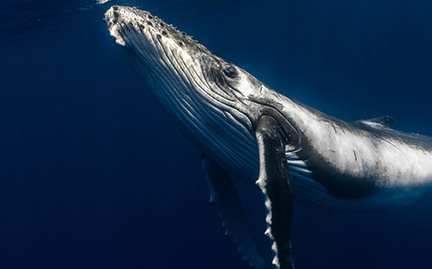 Like many of the songs composed throughout history, humpback whale songs have a unique and prominent structure. Individual notes or units (150-8000ms) are combined into subphrases and phrases that last for about 15 seconds. These phrases are then repeated or combined to form ‘themes’ that last for about two minutes. About ten themes are then sung continuously to form a song that lasts for about twelve minutes. When sung continuously, they form song cycles that continue for hours. The longest ever recorded song cycle is twenty-one hours. A fascinating feature is the cultural transmission of songs, in that all male whales in the same locale tend to sing similar songs during any period. The songs from one breeding season to another also generally remain unchanged. However, there is no evidence of synchronous chorusing amongst whales, and the song cycles do differ geographically. The humpback song in Hawaii is found to be different from that in Australia or the Caribbean. Like cetaceans, vocalisations also play a prominent role in the social lives of pinnipeds (seals, walruses etc). The major difference is that unlike cetaceans, none of the varied sounds made by seals, sea lions or fur seals have been elaborated into more complex vocalisations. Can Gorillas Play the Drums? When it comes to the African great apes, non-tonal and percussive behavior are the more common type of ‘song’ found, especially amongst chimpanzees. A parallel example would be that of wood peckers or various rodent species. This type of ‘instrumental music’ is actually quite rare among vertebrates. Fitch writes that although chimpanzees and gorillas drum on their bodies, and sometimes on objects during aggressive displays and play, there does not seem to be any reports of such behaviour in orangutans. Is Human Music different from Animal Music? Hauser and McDermott suggest that human song differs from animal song because animal song is largely reserved for mate attraction and territory defense. Another reason is the lack of evidence of solo performances, practice or productions for entertainment, while human singing is usually produced for pure enjoyment. Fitch argues however that this is misleading as young male songbirds have been found to sing alone, suggesting they may be practicing for later adult performances (“subsong”). Sometimes they also sing quietly and alone (“whisper song”). The third reason is that birdsong appears to be a predominantly male behaviour, while no such gender difference exist for human music. However, it is again argued that there are many bird species in which females sing as much as males. Another misconception is that if the female and male versions of a bird species looked identical, the singing individual was frequently assumed to be the male. Furthermore, it is found that the females of some species that do not normally sing can be induced to sing via male hormone treatment. Although in the case of whales, it does appear that only male whales sing. To conclude, it seems that whether the sounds of nature would qualify as ‘music’ will depend on how you define what is music. It also depends on how one differentiates ‘music’ from what is simply ‘sounds’ or ‘noises’. What is clear however, is that a wealth of songs and sounds do exist in the natural world. Thus, if you are a composer and are looking for new ideas, nature may be the answer for you. Chase, A. R. (2001). Music discriminations by carp (Cyprinus carpio). Animal Learning and Behaviour 29(4) , pp. 336-353. Fitch, W. T. (2006). The biology and evolution of music: a comparative perspective. Science Direct . Pingbo Yin, J. B. (2010, March). Do ferrets perceive relative pitch? The Journal of the Acoustical Society of America , pp. 127(3): 1673-1680. Which musical instrument is a good fit for your child?